Everyone is still in shock over the sudden loss of Paul Walker over the weekend, but business must push forward and this morning we have our first update on the status of Fast and Furious 7. 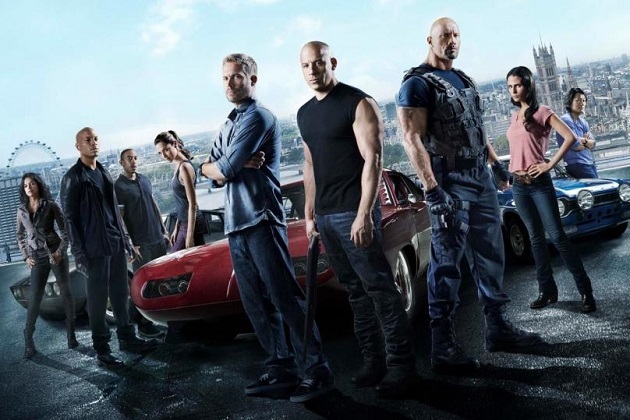 According to a new story on The Hollywood Reporter, studio executives met on Sunday morning to discuss the fate of the upcoming seventh installment in the Fast And Furious franchise. The film, which is being directed by The Conjuring‘s James Wan, was on a holiday break when Walker’s accident occurred. FF7 has been filming in Atlanta as recently as the days before Thanksgiving, but production has been put on hold until Tuesday or Wednesday at the earliest. Sources say the majority of FF7 has already been filmed, but that the entire cast was scheduled to shoot additional sequences in Abu Dhabi in January of 2014. We’ll bring you more information as this story continues to develop. Regardless of FF7‘s fate, fans of Walker will have two additional opportunities to see him on the big screen in the months ahead. His hurricane Katrina based drama Hours is due out later this month, and another film titled Brick Mansions is currently in post-production. The latter, which is being released by EuroCorp and Relativity, is an English-language remake of the 2004 French action movie District B13. That film should continue shooting with say Ryan Gosling as Walkers cousin who abruptly goes AWOL from the CIA when he finds out Walker has died – would be an excellent fit and script migration.